Even though I spent many years living in Japan every time I visit I still find random, fascinating aspects of the culture and country that I hadn’t noticed before. Instead of creating one long blog post I’ve decided to turn it into a series where each week I share one or two observations from my most recent trip. I attribute this to three factors. First, many restaurants have plastic replicas of menu items outside their establishment, making it easy to see what they serve just by browsing the window displays. Once you spot a plastic model of something that looks good walk in, get a table and order it. Think of it as buying an outfit right off the mannequin. Second, food photography in Japan is ridiculously good, prevalent on menus, and the food comes out looking pretty damn close to how it did in the photo. This goes for fast food joints as well. The lettuce is just as green and frilly. The beef patty is just as shiny. Everything is assembled with such exactitude you would think all the employees carried rulers. Third, if you happen to be at a restaurant that doesn’t have a plastic food display OR photos on the menu OR an English menu (where the heck are you? 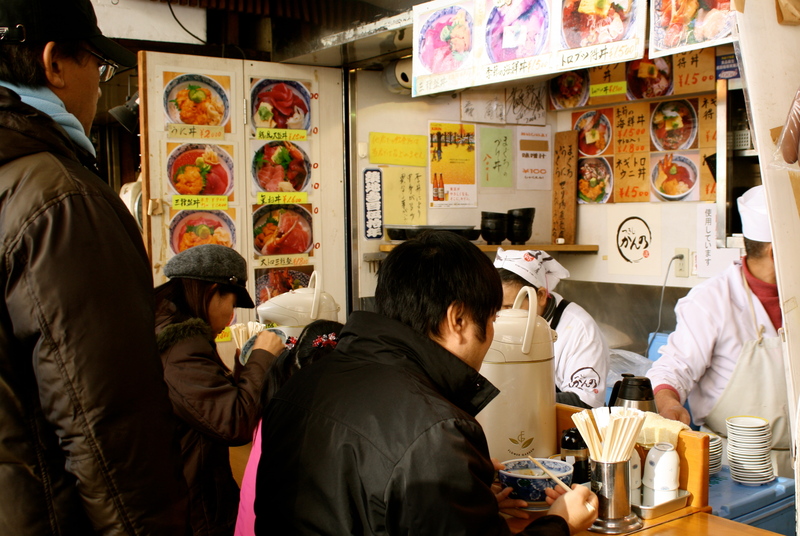 ), chances are high that your Japanese server will be insanely polite and will do their best to help you order anyway. Use gestures, point, and employ all the Japanese words you can remember. If you want to know what kind of meat comes with a dish, don’t be shy about resorting to barnyard noises. If all that fails take a page from my husband and sound out English words with your best Japanese accent. One evening on our recent visit to Tokyo I had dinner plans with a group of old co-workers, and left my non-Japanese speaking husband to fend for himself. Craving tonkotsu—fried pork cutlets—he walked around checking out the plastic displays until he found a restaurant serving it. He went in and got a table. To order a beer he simply said, bee-ru kudasai, and brought his hand holding an invisible beer mug to his mouth. He then pointed to the picture of the dish he wanted. The waiter nodded, scribbled down the order and then asked, “Uh, bura bura bura bura salada?” (I’m sure the waiter actually said real words but that’s what my husband heard and how he related the story to me) Perplexed but wanting to sound calm and in control, my hubby responded by phonetically mimicking the sounds but changing the last tone so that it came out as a statement rather than a question, “Ah, bura bura bura bura salada”. The waiter smiled and nodded, then hurried away to place the mystery order. My husband’s dinner consisted of two crispy pork cutlets, shredded cabbage, rice, miso soup… and a side salad.